2017 promises to be a huge year for the Scout Group as our sections develop brand new programmes delivering more activities and adventure to our young people every week and even early in January we've got some great news to share. Come and enjoy the atmosphere of the races and help us raise some funding for the group at our Race Night Fundraiser. We'll have a packed programme of races, pie and pea supper and it's a great family event. Everything kicks off at 6:15pm on Monday 13th February. We've received two very exciting letters in the post which confirm that we've been successfully awarded two grants. The grants will be used to purchase new camping equipment for the group which we hope means we can offer even more exciting opportunities for our young people. The Leslie Sell Foundation has awarded the group £500 towards the cost of camping equipment which we're looking to use to purchase a mess tent. We've been invited to take 2 young people to the High Sheriff's Award Presentation in March at the Centre for Life where we'll receive an award for the group. We'll find out how much on the evening. We're collecting Sainsbury's Active Kids Vouchers and we'd appreciate your support as the vouchers enable us to purchase games equipment for use at beavers, cubs and scouts. Please make sure you pick up vouchers when using the self service checkouts and collecting fuel. We're aiming to beat last year's total vouchers. Just drop them in to you section leader. Our group executive continues to work behind the scenes to support our leaders to deliver our busy programme of activities and have agreed a fundraising target of £2,500 over the next year to purchase more equipment. The group executive is like the governing body of a school and works in the background to ensure the smooth running of the group and support it's development. You can find out more about the purpose of the group executive and read their minutes here. The group executive aims to publish a development plan for the group following it's next meeting in March. Do you have a Grandparent with an empty garage? With all of our fundraising plans coming together we're looking for a small storage facility where we can keep our camping gear locally and we'd love to talk to you if you have a relative with an empty garage who may let us use the space for a small monthly fee. We welcome Laura, Darren, Melissa, David, Graeme, Helen and Andrew to the growing team of people supporting scouting at 4th Washington. Laura has chosen to take up an assistant cub scout leader role, while our parents rotas have been strengthened with so many people coming aboard. It's a huge success story and one we intend to continue throughout 2017. We're still looking for more support, if you can give up 2 hours a month you can join a parents rota and help us to do more. Please contact Stephen Harrison (gsl@4thwashingtonscouts.org.uk) for an informal chat. It's been a very busy couple of months with tonnes going on at 4th Washington Scouts and we wanted to share some of the best bits from across all sections with you and invite you to our family event and AGM on Saturday 16th July. Our beaver colony never slows down and beavers been enjoyed bouldering, an international night, making massive towers with spaghetti and marshmallows (we think a few might have been eaten along the way!) and getting outdoors in the run up to half term. Last weekend, the colony joined others from Durham Scout County for the Beaver Picnic where they had lots of fun running around, crate stacking, getting crafty, and making some new friends. The adventure doesn't stop there and over the next 5 weeks, beavers will be looking after some feathered friends, problem solving, spending time outdoors running riot and will be out and about in the local community. There will of course be more crafts, more games and tonnes of fun! Download the programme here. Beavers can look forward to their next sleepover at the end of July which promises to be an amazing end to their summer programme with an animal theme and an underwater adventure being the highlight. While the excitement is building, why not check out our Facebook page for photos from past events. Cubs from 4th Washington recently joined 850 others from across Durham Scout County for Cubboree 'the Wildest Birthday Party Ever'. The event celebrated 100 years of cubs and cubs spent 3 nights in camp, enjoying activities which included Segways, climbing and abseiling, waterwalkers and an International Day which took them around the world in 3 hours. Our cubs have also been across the Pennines to spend a night with the stars, sleeping at Madame Tussauds in Blackpool surrounded by the likes of Lady Gaga, Bear Grylls and Cheryl Cole to name but a few. It was certainly a night like no other! Cubs programme has taken them on a journey of discovery and in the process they've learned some first aid skills, surfed the flow rider and gone Old Skool with some scouting games from the past. It's incredible that our young people could save a life and they're not even 10! Cubs new programme has loads to look forward to as it takes them outdoors to enjoy the light nights and gets them closer to nature. You can download it soon from our downloads page. We also congratulate our young leader Drew who became the first in the Houghton-Le-Spring District to complete his young leader award and gain the gold edged necker, his contribution to the cub section is very valuable (even if he did show off a bit on the Flow Rider!). 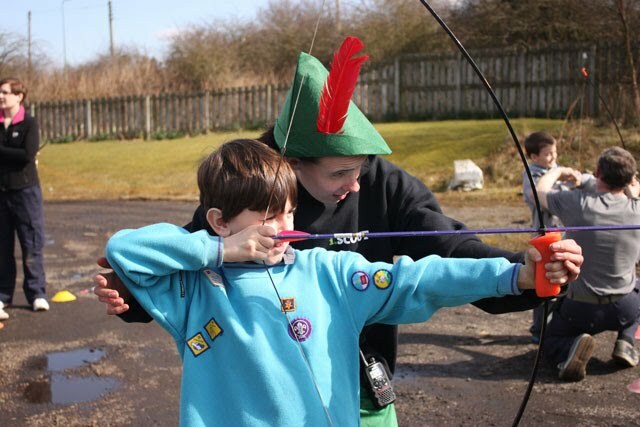 Adventure is always on target for scouts and they proved this by hitting the bullseye arching this week as part of their busy and active programme. The troop has been out geocaching, cooking outdoors and is looking forward to a rocket fuelled night next week before a trip to Infinite Air to go wild. We're pleased to welcome Phil to our team of adult volunteers, Phil has previously volunteered with 1st Fatfield and 3rd Washington and will support our adult team and young leaders to offer new adventures which will put a smile on the face of every scout each week. The troop are invited to join our friends from 3rd Washington for their annual Summer Camp in North Yorkshire and experience the adventure of a lifetime from 23rd to 30th July 2016. More info is online here. We launched our Bonus Ball game last month and our first winner Susan took home £37 when her number came up. The bonus ball game costs £1 a week to play and helps the group to raise vital funds to help buy new equipment and expand our weekly offering of activities. You can find out how to join the bonus ball game by visiting our bonus ball webpage or find out about some of our other fundraising initiatives by visiting our fundraising pages. We would also like to say a huge thank you to everyone who has collected Sainsbury's Active Kids vouchers for the group, we expect to have some great new games kit delivered in September. Join us on 16th July for a Family Fun Day and our AGM. We'll quickly get the formal business out of the way and then we'll have games, challenges and fun for all of the family. Mams and dads, we hope you're up for a challenge. We'll also be presenting some well deserved Chief Scouts Awards, investing our newest members and presenting badges from the last couple of months. We'll announce times and activities on our events page very soon and we'd be really grateful if you could book in so we know how many people to expect. We're working hard to update our website so that it's easier to find useful information and so that it shows just how busy we are and we'd love some feedback if there's anything you think we've missed. Please contact Stephen Harrison (Acting Group Scout Leader) on 07745 184 137 or email gsl@4thwashingtonscouts.org.uk to have your say. We hope our updated parents pages make it even easier to find all of the info you need! You can also find us on Twitter and Facebook where we'll continue to post photos from our adventures and tweet some of our highlights. We as a group continue to be incredibly grateful for all of the support we receive from parents each week and we look forward to coming together on 16th July. Initially the group has opened a beaver colony with 16 members who will be invested (make the beaver scout promise) on the evening of the 23rd May in a ceremony at Lumley Castle. The group has ambitious plans to open a cub pack and scout troop within 6 months. Members of the press are invited to attend this special event at Lumley Castle, on the 23rd May 2013 at 6pm in the Baron’s Hall. 23rd May 2013: Houghton-Le-Spring is today celebrating the launch of a new scout group, the first time a new group has launched in the area in 30 years. 16 beaver scouts will make their beaver scout promise and enjoy a magical Harry Potter programme night at Lumley Castle. The 16 beavers will be the first members of the beaver colony and of the new group. Proud parents of the 16 beavers will watch their child making their beaver scout promise and receive their group necker in a very unique location in the Barons Hall at Lumley Castle. The neckers show that beavers are a member of 4th Washington and by making their promise, they become a member of the worldwide family of scouting. Invited guests including local councillors, teachers from Lambton Primary School and local members of the community will be attending the event as supporters of the group. The colony is the first section to be opened by 4th Washington Scouts and is based in the west of Washington. The colony gives more children in the area the chance to make friends, play games, go on visits and help others. Since their first night in April, beavers have already found out what it means to be a beaver scout, visited the local fire station, learned about the emergency services and enjoyed a Lambton Worm themed adventure. In the next few months, beaver scouts can expect a new adventure every week including attending a “sleepover”, an amazing first night away from home. The group meet every Thursday at Lambton Primary School and the school has welcomed the group into their new community centre providing a fantastic facility for beavers to be creative, to play games and to have fun. Support from the headteacher and school governors has enabled 4th Washington Scouts to quickly establish in the school and begin an active programme for beavers. As well being supported financially by Gentoo and Sunderland Council, the new colony has been made possible by new volunteers coming forward to take on leadership roles in the group. Now established, the colony will soon double in size, however, we still need more adult volunteers as there are over 200 young people waiting to join scouting locally. To find out more about volunteering opportunities in Washington, please visit www.hls-scouts.org.uk/volunteer, or call 0845 300 1818. Fun and friends was the theme of the night as 16 incredibly excited young people met at Lambton Primary for their first night of beavers. The night was spent getting to each other and meeting the new leader team running the colony, including two volunteers who are completely new to scouting. Beavers made friendship trees and worked together to make a Baden Powell's Shelters in their new lodges (where they enjoyed juice and biscuits). The also enjoyed getting to know each other quizzes and of course, there were also plenty of games where beavers could let off some energy including chuck. Beaver scout lodges are smaller groups of beavers within the colony, lodges often work together in team games. There's going to be loads going on in their first programme, as Beavers them find out what it means to be a beaver scout, find out about the local community with a visit to the fire station and meet some furry friends and take part in their first sleepover. You can download a copy of the current programme in our downloads area and information about the investiture and sleepover will follow soon. 4th Washington Scouts is a new group which opened to young people on 25th April 2013. The group is the result of new volunteers coming forward to take on roles within scouting. Could you help us grow the group by becoming a cub leader or a member of the group executive? Find out more about volunteering at www.hls-scouts.org.uk/volunteer. Thanks to the enthusiasm of our 124 adult members, scouting has grown again in Houghton-Le-Spring with a further 74 young people joining the adventure. Overall that's a fantastic 13% rise on 2011. The news comes as details of The Scout Association’s annual census are published today with total UK membership now standing at 536,787. The continued growth of scouting in Houghton-Le-Spring - the twelfth consecutive year of expansion - has helped cement Scouting’s position as the largest co-educational youth Movement in the country. A large part is of this growth is due to the district opening new provisions for young people aged 6 to 8 in the west of Washington and Hetton-Le-Hole to meet demand for scouting locally. The district has been able to do this as a result of new volunteers coming forward to take on leadership roles in scouting. More and more of our adults are choosing to volunteer flexibly just like the Duchess of Cambridge, one of Scouting's highest profile volunteers. Flexible volunteering allows adult volunteers to give as much or as little time as they have available and to fit scouting around their busy lives. We hope the Duchess’ involvement in scouting will inspire other adults to get involved in Scouting and to help us to continue to grow the adventure. "Like me I'm sure you fit your volunteering around a very busy lifestyle, but my mum used to say if you want something doing ask a busy person. I'd really like to say a massive thank you to you on behalf of all the young people who benefit from Scouting. It's basically because of what you do. Together you make the adventure possible." “It’s great that so young people and adults are joining the Scouts, more than ever before, and I am sure this increase has had much to do with the Duchess of Cambridge becoming a Scout volunteer last year. The Duchess yesterday celebrated the achievement of over 400 Scouts and adult volunteers at Windsor Castle. The event recognises the outstanding achievements of both young people and adults in scouting. Our district commissioner, Jonathan Chicken received the Silver Acorn, an award for outstanding contribution as to Scouting as a volunteer. Chief Scout and international adventurer Bear Grylls also attended the event at Windsor castle. You can find out more about becoming an adult volunteer on our volunteer page, whether you are interested in working with young people, could help with the management of one of our groups, or could help our fundraising efforts. We're on target to bring more adventures to more young people in Washington as our beaver colony opens in Lambton. Parents of young people aged 6 or 7 can come and find out more about scouting, joining beavers and meet our new leader team. Parent's Meeting: Drop in for a tea or coffee, collect a parent's pack and meet the team. The first meeting of the new beaver colony will be on 25th April. Beavers are the youngest section of the scout family and are young people (boys and girls) aged 6 to 8. Beavers enjoy exploring the world around them, making friends and going on visits. Many beavers experience their first nights away by joining the colony on a beaver sleepover. Welcome to the new website of 4th Washington Scouts. 4th Washington Scouts is a new group opening in the South West of Washington in Spring 2013. The group will provide adventure for young people aged 6 to 8 when it opens it's beaver colony and has a development plan to open cub and scout sections over the next 3 years. The group will be part of Houghton-Le-Spring District and is the result of an ambitious development plan to grow scouting in the area. 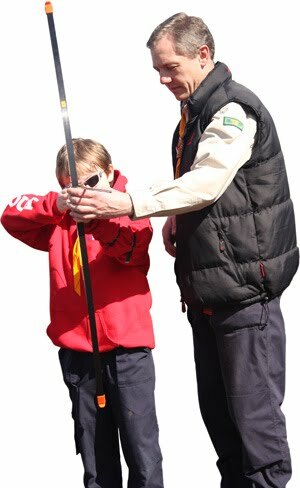 The plan has seen the district grow year on year for the past 10 years, and now over 700 young people and adults enjoy scouting in the district. The aim of 4th Washington is to promote the development of young people in achieving their full physical, intellectual, social and spiritual potential, as individuals, as responsible citizens and as members of their local, national and international communities.